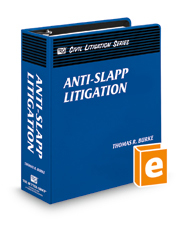 This deskbook is a comprehensive treatment of California's landmark "anti-SLAPP" legislation (CCP §§425.16, 425.17, 425.18). It fully explains how the anti-SLAPP legislation works - particularly how defendants may invoke CCP §425.16 to strike any civil cause of action that arises from petitioning or free speech activity – and when and how plaintiffs may overcome an anti-SLAPP motion to strike. You will find clear organization and analysis of the hundreds of state and federal appellate decisions that have interpreted California's anti-SLAPP law, along with invaluable practice tips and forms.